Every woman deserves to have a special place set aside solely for her comfort and beauty. No, this isn’t the bathroom. Although many women choose to use their bathroom as their go-to spot for getting ready, a makeup vanity table is a far better sanctuary. For a woman trapped in a hectic morning routine, a makeup vanity table is the perfect feminine retreat to prepare for the day. This special piece of furniture is specifically designed for women. Unfortunately, not every vanity is the best, most practical option. 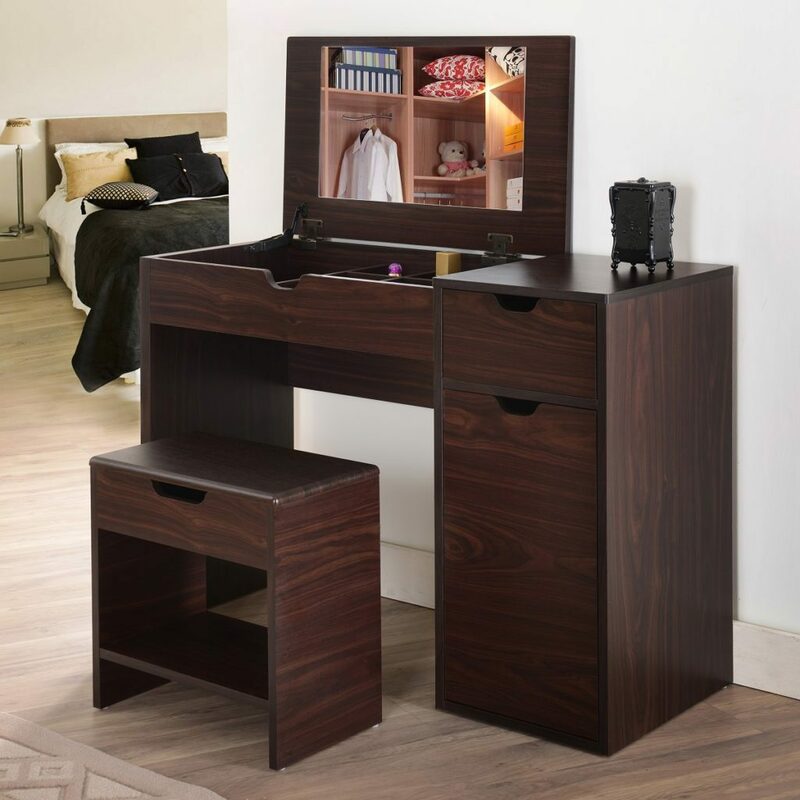 Some makeup vanity tables are lovely to look at but offer very little storage and functionality. If you’re looking for a vanity that’s both fashionable as well as functional, consider these top models! This beautiful ivory-white vanity is equipped with a matching 3-panel mirror and comfy stool. Although it’s breathtakingly charming, it offers ample drawer storage for all of your makeup, hair supplies, and accessories. 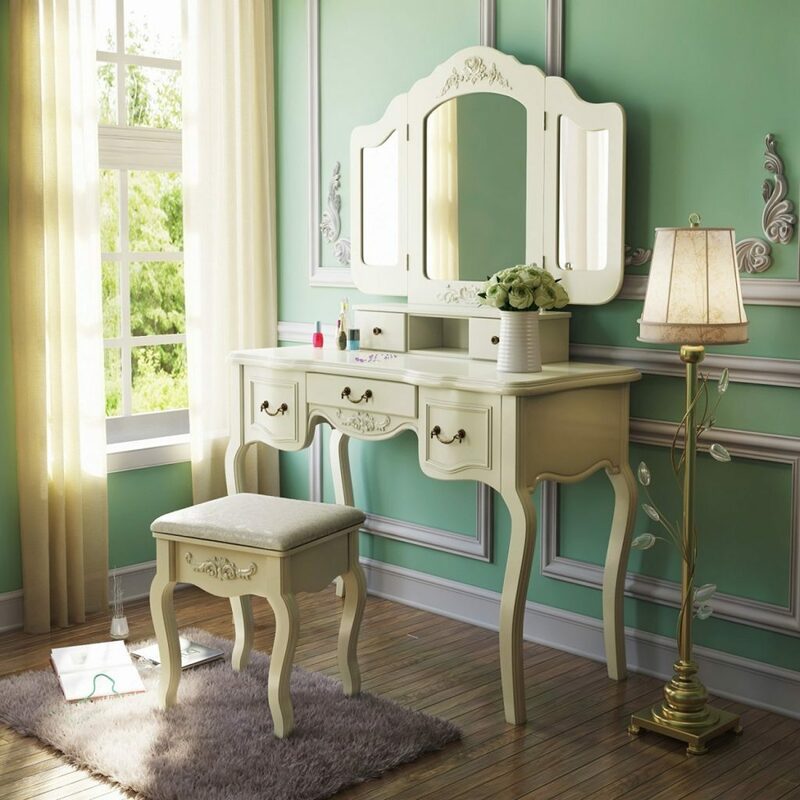 Starting your day at this lovely, French-inspired vanity allows you to easily channel your femininity and charm for the day. 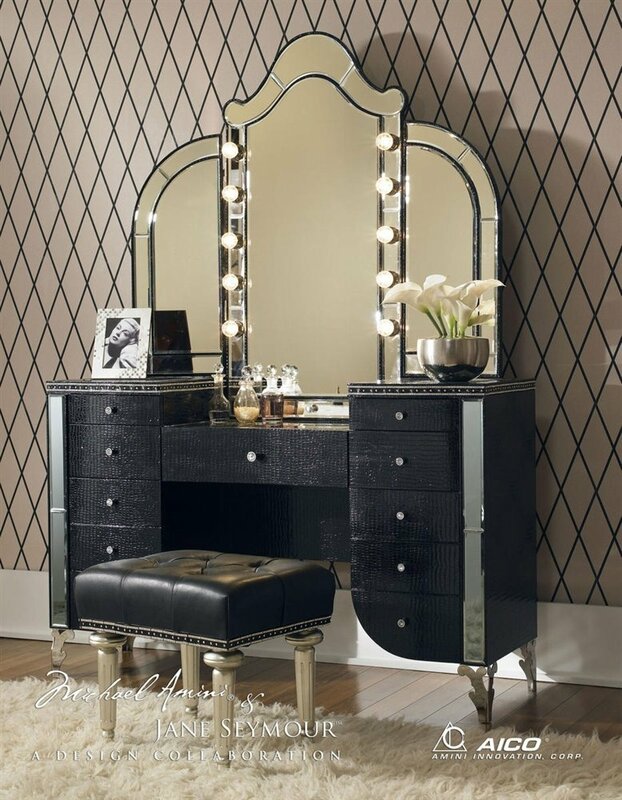 Channel your inner movie star with this glamorous vanity option. This choice includes a large vintage style mirror with signature retro light bulbs around the rim. Ample drawer storage allows you to easily store larger hair appliances as well as your entire makeup collection. Spending your morning primping at this stylish vanity will keep you feeling like Hollywood’s favorite starlet all day long. With a grand total of 7 drawers in 4 separate sizes, this vanity is by far one of the best in terms of storage potential. When paired with the matching “hutch,” you also gain several cute storage niches to use as partitioned “hidey-holes” for smaller articles such as jewelry and perfume. 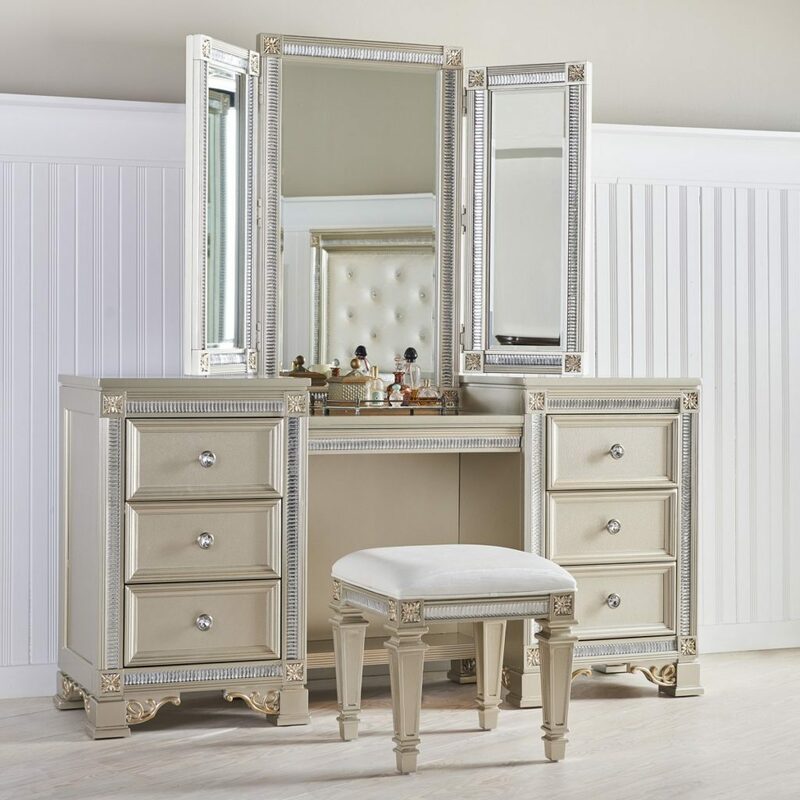 Although packed with storage, this vanity still retains a modern, but classical beauty guaranteed to give your whole room a decidedly feminine flair. If you’re concerned about the vanity’s effect on your bedroom’s natural decor, consider a subtle alternative such as this sophisticated option from Hokku Designs. Unlike many other vanity styles, this option doesn’t appear to be a vanity at first glance. It’s rich wood and sleek style easily blends into a bedroom’s natural beauty. Stylized drawers offer an array of storage for almost any size and shape. If you’re concerned about sacrificing your bedroom’s motif, this vanity is your best option to preserve your natural style. For women looking for a more modern, minimalistic motif, this vanity from Bombay Heritage is the perfect simplistic and functional alternative. Equipped with a built-in electrical plug and fold-down mirror, this vanity easily transforms into a great office workspace. Paired with a comfy office chair, this vanity is an efficient and productive space for multiple projects. Whether touching up your makeup in the morning or going over office files from work, this vanity greatly simplifies any project. Selecting a new makeup vanity is a huge investment. Although it may feel like an unnecessary frill, when carefully selected for your needs, this piece of furniture can easily revolutionize your entire morning routine. Take some time and creativity to pick the piece that best meets your unique needs. You’ll definitely thank yourself later!